Also other smaller gains, including paid personal leave for bereavement and illness. This news comes just as TMP has learnt that there has been progress made in the Justice for UBS Cleaners campaign involving Alberto Durango and also Juan Carlos who has just won a case against his employers in court for unfair dismissal. The cleaning sector has been fully privatized at the end of the nineties. Since then competition has been driving wages down and work pressure up. In the summer of 2009 cleaners, of whom most come from a migrant background, launched a campaign for higher wages, better working conditions and more respect from management. In times of austerity and a government drive for a wage freeze for public workers, this campaign raised the stakes of industrial conflict. If the cleaners could get a raise – why couldn’t other workers? 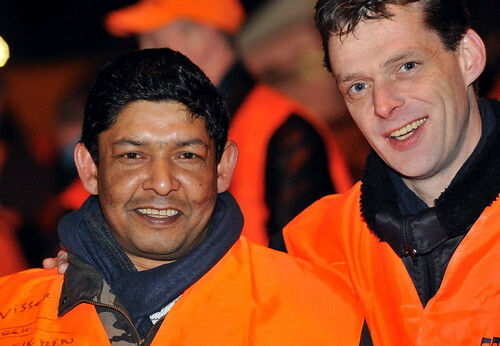 The campaign turned into a model for multicultural resistance against the cut-backs. Let me take you back a month ago, somewhere in Amsterdam: It was crowded in the room, more than a hundred strikers from several Amsterdam office buildings sat together in their weekly meeting; it seemed chaotic, people going for coffee or a quick smoke, several different languages were being spoken at the same time, English, Turkish, Arabic and of course Dutch. But it wasn’t chaotic, it was excitement, tension and translation. Abdelilah, a young migrant on strike, had just told everybody that he had been fired for being on strike, the company letter went from hand to hand. 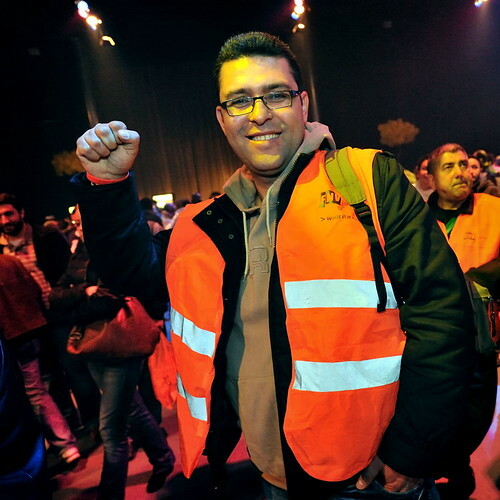 Only recently arrived in the Netherlands, when asked to go on strike, he didn’t hesitate, “in Morocco I used to do the same”. Mohamed a strike leader from government agency UWV, stood up. He reminded everybody about this fact and about the resolution that had been passed by all cleaners on strike in the Netherlands. An injury to one, is an injury to all. “We made this agreement, now we must live up to it, we must all go to his workplace, and demand his reinstatement. It could be you next time”. He said as he looked his fellow strikers in the eye. Turkish women applauded while Mohamed raised his hands. As a union organizer, that was the signal to take my phone and make the call. So it happened, later that week five hundred strikers from all over the Netherlands, marched to the headquarters of right wing newspaper “De Telegraaf”, Abdelilah’s former workplace. 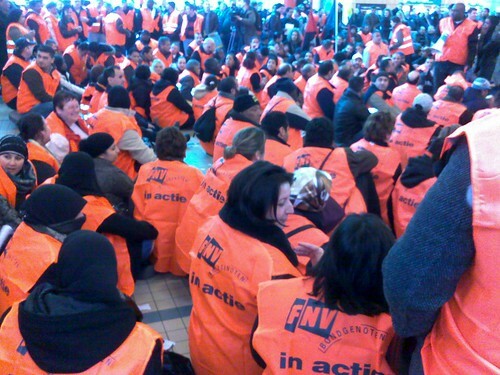 As they had done a dozen times before during the strike, they occupied the lobby after train cleaners from Groningen broke through security lines to hold the doors open. Swarming the building, they demanded freedom of speech and organisation for cleaners, something a newspaper should value. The cleaners presented a front page for the next day to De Telegraaf spokesperson which said they should support the cleaners. The boss of the cleaning company was summoned to the office, as a delegation of cleaners was appointed to do the negotiation. Two hours later, Abdelilah had a new contract. The news of the victory spread amongst the strikers while they were already busy occupying another lobby. Hundreds of cleaners had just proven how precarity can be overcome. A valuable lesson for everyone, not least for the employer. In the end it took the cleaners six months of actions and nine weeks of strike to win a new national labour contract, the longest strike in the Netherlands since 1933. They won a 3.5 percent wage increase, job education, Dutch lessons and benefits for union members. But above all, they fought for recognition and respect. “What do we want? Respect! When do we want it? Now” was and is their chant. Everybody in the Netherlands now acknowledges the cleaners; they gained massive public support and positive media coverage. They showed the Netherlands that when nobody takes responsibility people become numbers on a budget, creating dynamics that constantly put pressure on their already low working conditions; that is the cost of outsourcing. In their strike many different backgrounds and ethnicities came together and held each other close. They occupied Utrecht Central Station for six days and nights, singing, dancing, demonstrating, eating and sleeping there. 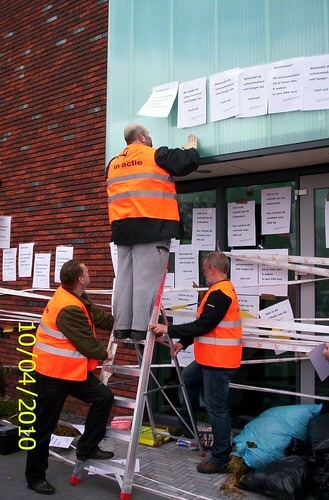 Taking the roof of one of the cleaning companies’ headquarters, linking arms during a sit in at the airport defying security and police forces, presenting the drawings of their children to the queen. They overcame the employers’ tactics of despair; their willingness to fight seemed endless. For now the cleaners won a strike for a total workforce of the 150,000 cleaners with only 1500 active strikers, which shows how much more can be gained with further struggle and unionisation. What’s most important however, is the influence of the strike on other sectors. Straight after the victory of the cleaners the garbage collectors of Utrecht and Amsterdam went on an indefinite strike, which ended after one and a half week in a pay rise of 1.5 percent for 200,000 municipality workers, breaking the wage freeze of the government. It proves that you only stand a chance if you fight, an important lesson for the coming struggle over the massive cuts.